When moving houses, you want to work with a mover you know you can trust. Since 1995, Riley Moving & Storage has been the premier Des Moines and Davenport residential moving company, allowing us to learn and grow with the city! We know Des Moines and Davenport well, and the knowledge is reflected in the quality service we provide. You can also trust in us as a family-owned business! Since 1995, The Riley family has provided leadership to make us the best in moving. As an agent of North American Van Lines, we also have the resources and training to keep us on top of the moving market and trends as Des Moines and Davenport household movers. We offer it all. Just decide when and where you want to move, and we have the services to get you there on time. If you’re going the distance, we’ll make sure your belongings make it safe and sound. Transitioning to a new state can be stressful, but with Riley Moving and Storage, it doesn’t have to be! Even when you’re staying in state, you need movers like us that can handle all your needs! Just because your move isn’t far doesn’t mean it shouldn’t be treated with care! Packing and moving your apartment is a big undertaking, and having an expert team of movers on your side can make all the difference in a stress-free process. It’s easy to be overwhelmed by the process of packing up your household and moving to a new home, and Riley Moving and Storage is the local company you can count on to have a seamless experience. We work with your employer to make sure you get to your new home smoothly and quickly. Trust us to proudly serve the United States Military as respectful and efficient movers. Let us take care of the details. All you need to do is decide when the move will happen! We’re the Des Moines and Davenport residential movers you can rely on. Fill out our online moving quote form or call us to request your FREE estimate now! At Riley Moving and Storage, we understand that every minute your business isn’t running is a moment of lost revenue. That’s why as Des Moines and Davenport commercial movers, we work to minimize downtime so that your business will be up and running again in no time! As agents of North American Van Lines, we have the training and equipment needed to streamline the commercial moving process. This combined with our years of experience gives us the ability to handle any size and scope commercial move. No matter what your Des Moines and Davenport commercial moving company needs are, we have the ability to handle them! Not only do all of our commercial moving services minimize downtime, they also come at a fair price for your business’s specific needs. Whether a department, division or your entire business is planning to move, we can plan and execute the transfer expertly and efficiently. Sensitive electronics will get special care with our computer moving services. Time is money in the world of business, and that is never more true than when you are trying to plan an office relocation! We handle large scale hotel moves just as efficiently as a single home residential move! We’ll work with you to keep your books, videos, and other items organized and ready for the next location. Our Des Moines commercial movers set the standard for moving and transportation excellence. Contact Riley Moving and Storage by calling us or filling out our online form for a free moving estimate! Whether you’re looking to declutter your home, clear some office space, or store important documents, Riley Moving and Storage has the space to keep your items safe. With warehouses in Cedar Rapids, Des Moines, Davenport, and Iowa City, we offer the Des Moines and Davenport storage solution you’re looking for. We make sure that your items are kept in highly-protected surroundings. All of our warehouses are spacious, secure, and temperature-controlled to keep your belongings in top-condition. Use our Des Moines and Davenport storage services for any type of storage need! With over 100,000 square feet of storage space, we can hold virtually anything, from commercial goods to computer equipment! When you transition to a new home, it’s easy to get overwhelmed by all of your belongings! We’ll help you ease the stress by storing your items in our facilities for as long as you need. Your business’s storage needs will be addressed with our services including inventory controls, commercial product storage, logistics/distribution projects, and more! 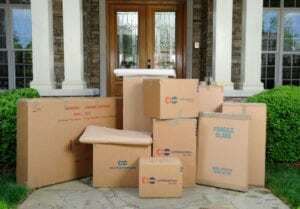 You can trust Riley Moving and Storage to offer the best in Des Moines and Davenport moving and storage services. Call us or fill out our online form to request a free estimate! For any of your out-of-the-ordinary moves, Riley Moving and Storage has the skilled crew and state-of-the-art resources to make it happen! Our Des Moines and Davenport specialized movers ensure secure and efficient transportation of items in all shapes and sizes. Leave Your Bulky Items to Our Des Moines and Davenport Specialized Moving Company. As a Des Moines and Davenport specialized moving company, we concentrate on providing a diverse set of services to cover you in any moving scenario! Our talented team is well-trained in the set-up, delivery, and shipping of tradeshow exhibits and displays! No matter where you’re going, we have the resources and expertise to get your car, motorcycle, boat, or other vehicle wherever it needs to be. With the right equipment and our experience, your valuable fine art and antiques will make it safely to their new home. We work to understand your unique needs so that we can create a moving plan that best protects your sensitive lab or medical goods. For the items that need extra care and attention, our white glove moving services keep your fragile goods safe. Our company will manage every phase of your product shipment - from start to finish, all the while keeping you on track with your schedule and your customers. North American Van Lines partnered with CRST Specialized Transportation to provide you with a skilled team that can cater to your special shipping needs. Our LTL trucking services allow you to transport just the amount you need! When you’re crunched for time, we’re well-equipped to quickly get your goods where they need to be. Interested in using a Des Moines and Davenport specialized moving company? Call Riley Moving and Storage or fill out our online form for a free moving quote!